Three Best Ways to Save Lives. Doctors are the Human Element! Laughter is good Medicine. 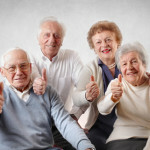 Find Assisted Living that makes you Laugh! Visit our assisted living / residential care home to know more about the facilities, staff and environment.